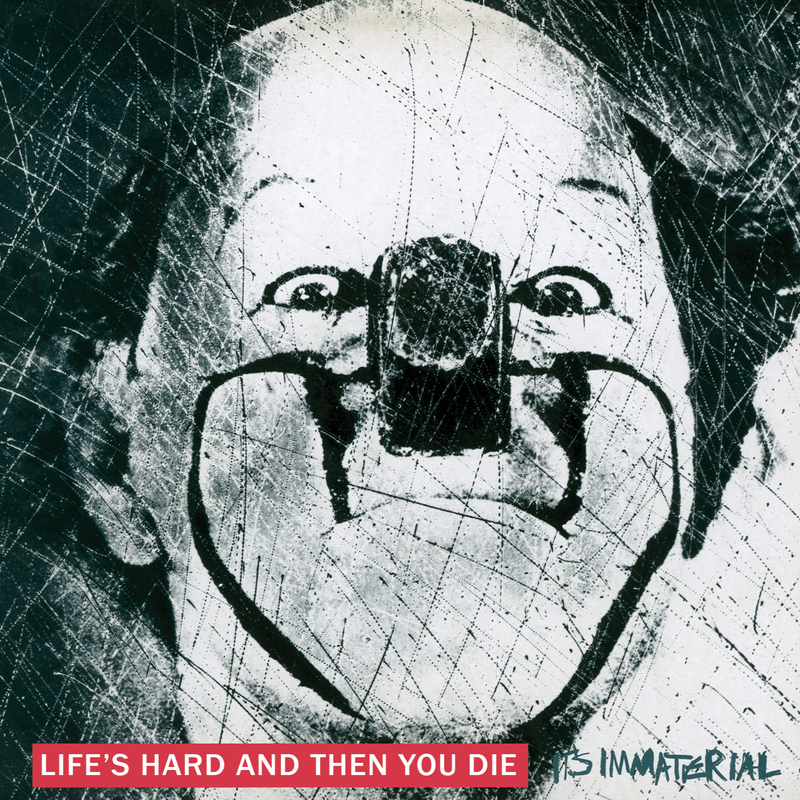 Caroline International will issue an SDE-curated 2CD deluxe edition of It’s Immaterial‘s 1986 debut album Life’s Hard And Then You Die, this summer. It’s Immaterial were a Liverpool-based indie-pop band, active during the whole of the 1980s and the beginning of the 1990s. They were championed by John Peel in the early years and issued a number of singles and EPs between 1981 and 1984 on independent labels, before being signed to Virgin Records’ imprint Siren, in 1985. Originally a larger outfit, by 1984 the band were reduced to a duo of John Campbell (vocals, guitar) and multi-instrumentalist Jarvis Whitehead. In the studio, this offered the flexibility to bring in contributors as needed, which largely came from a pool of friends and musicians in and around the Liverpool area (including Henry Priestman and The Christians). Life’s Hard and Then You Die was recorded in 1985/6 and was produced by Dave Bascombe who had previously engineered the Tears For Fears’ album Songs From The Big Chair. The album is an attractive hybrid of new wave, country, blues, folk and pop and underpinned by Campbell’s narrative style, showcased famously on the single Driving Away From Home (Jim’s Tune) which was a top 20 hit in 1986 and was a staple of daytime radio at the time of release. Three further singles, including Ed’s Funky Diner were issued. The new 30th anniversary deluxe reissue has been put together by SDE’s own Paul Sinclair and created with the full cooperation of John Campbell and Jarvis Whitehead. Audio has been newly remastered from the original tapes and this will feature B-sides, remixes and radio sessions amongst the bonus tracks. Stay tuned! If you are interested in this reissue and would like to keep up-to-date with the latest news (track listings, limited merchandise, signed items, special events), then please enter your email address below to get on the It’s Immaterial mailing list (you’ll get a confirmation email, so please check your spam/junk mail folders). Just bought it, but why the oversized CD cover? Just does not fit into my shelf and looks odd. Would also love to see these chaps previous band Yachts reissued. There was a reissue of the debut at one point I believe but it is long out of print. ‘Lifes Hard’ is a brilliant record and the follow up ‘Song’ (1990) reissued on Cherry Red a few years back is even better to my ear. Just bought my copy. Always one of my fave albums, and brings back many happy memories of friends partying together in the 80s, with songs from this album as one of the familiar backdrops. Thanks. Thanks for your email with the tracklisting of the Deluxe Edition for this album, Paul. It appears to be very thorough and looks as though it covers everything released on Siren around the original album as well as a couple of tracks I’m not familiar with (Kissing With Lord Herbert and The Enthusiast’s Song Version of We’ll Turn Things Upside Down). Would love to have had a few more demos as really enjoy hearing how songs have been developed by a band and the producer during the recording of albums. Also, pity we couldn’t get to hear the Jerry Harrison-produced version of Driving after all this time. Still, this looks to be an excellent release and I’ll definitely be making a purchase from my local HMV on release day. Thanks for suggesting this title for a deluxe reissue to the record company. In all honesty I never thought this album would ever get such a treatment as it never really sold that well. Now let’s hope the crowdfunding project for ‘House For Sale’ kicks off soon. Great track list, Paul! And the booklet…? I always thought there was more to this band than first impressions. I only bought the 12″ single, then forgot about them. Thanks for bringing the band back to my/our attention Paul. I`ve ordered the S.E. of L.H.A.T.Y.D and the second album `Song`, once again thanks Paul. Paul is this going to be sold on other online retailers apart from Amazon ? That’s good thanks as i usually order from HMV and they always deliver on the release date if not before. Much cheapness – £11.22 at the mo’ on Amazon UK. Paul, is that a digipack? Consider it pre-ordered and thanks Paul for putting it together; it will be a nice addition. Have the master tapes been treated with the sensitivity they deserve- no brickwalling or extra compression applied?? Count me in then. Both my copies look as if they have the ‘golden staph’ thing happening, although at this point, they play as well as ever. Such a timeless album. I subscribed via the competition page and also haven’t had an email. I like how the 7″ and two 12″ versions of Driving Away From Home all had different lyrics for the verses. Happy to add you manually? Fantastic news, can’t wait to finally get ‘Space, He Called From The Kitchen…’ 12″ version on cd! Great news on this forthcoming SDE. Love this LP and have prior to (WMH/Fish Waltz/Gigantic Raft) singles – would be great to have these and associated b sides (especially ‘When the Revolution Comes’) on CD! FYI – I added myself to the mailing list. However I have not received an email and I have also checked my spam/junk and it is not in there. Hmmm dunno what happened there my post posted itself while i was still typing. Anyway to finish what i was saying i sent them an email and received no reply back and that was 3 years ago. Still find it very weird why they only did their last Virgin album and not the rest. 1) Fingerprintz – “The Very Dab”, “Distinguishing Marks”, “Beat Noir”. 3) Industry – “Stranger to Stranger” (Capitol/Universal). Add Feargal Sharkey’s debut album to that list. That era had so many great non-album single B-sides! They really need to be released digitally one day. Incl the extended versions and maybe the single edits too. Wow this has made my day! Really looking forward to this! China Crisis reissues were mentioned, is there anymore news on that? Echoing everybody above – this is fine news. I recall that there was meant to be a Pledge campaign for House For Sale as well this year, so I’m hoping that won’t be too far behind. I hope we get both the 7″/12″ versions of Space. Very, very good news, speaking as another victim of bronze rot on my original copy. And as others have already commented, let’s hope this is followed by a deluxe version of ‘Song’. A genuine lost gem of the 90s, that one: the Blue Nile meets Mike Leigh. So at odds with the times it arrived in, and all the better for it. Melancholic, quietly desperate and uplifting in equal measures; very, very English tales of everyday life. What a fine album. Hopes were high back then for hearing where messrs Campbell and Whitehead’s experimental spirit would take them next, but, well… we’re still waiting to find out more than 25 years later. Over the moon this is happening as my copy had succumbed to that bronzing rot years back and is unplayable. Fantastic news,that’s made my day that has! What a wonderful unique album and group….never tire of listening to it.Agree ,a compilation of all the pre “Life’s Hard” material and a release for the missing third album would be most welcome.Good work Paul! As bonus tracks, I really do hope they add the singles “A Gigantic Raft” (7inch version and 12inch ‘Tempest Mix’) and “White Mans Hut” as neither of these were on the album. Although these singles were released a few years before the album it would be great to have them added as they have never been available on CD. Fingers crossed that this will happen. Good to know I do not have to bother purchasing a used (and possibly not great condition) CD of this album from Ebay or Amazon. Glad I never did now with a 2CD Deluxe Edition on its way. Yippee! I subscribed but haven’t received my confirmation email. I got the email thanks. When are we expecting this to be released probably around August time ? No, it will be in July, I think. Sounds great, any chance the unreleased 3rd album “House For Sale” might get a proper release, the tracks I have heard are wonderful. I second a major Beloved reissue campaign, including all the pre Happiness material! One of my all-time favourites ! Looking forward to upgrading my own compilation (the original sound volumes were all over the place) and hopefully hearing a couple of things that I didn’t know about. What i loved first about them were their mix names, the keinzhold caper, wicked weather for walking, dead mans curve etc, second only to The Beloved in titling 12″ versions. Now can we have a 6cd set for ‘Happiness’ please? nice. I like your ‘subscribe’ button. Am I right in saying Jerry Harrison of Talking Heads had a go at producing them but hated it, and wanted his name of the credits, or did I imagine that? You are right. John and Jarvis talk about this in detail in the notes which go with the new reissue. I’m in. What a great band. Hopefully there will be something I haven’t got on there! That’s great, Paul! Congrats on all the inroads you’ve gained in putting together great reissues! Here’s hoping you can put that considerable influence to good use and rescue the Mighty Lemon Drops’ catalog. They are a band I always felt deserved reissues on the caliber of the JAMC ones. I know Cherry Red has put out compilations and Wounded Bird has licensed the albums proper, but as I said, I think they deserve better. Oh, wow. Looking forward to this one! Good one! Would love an early EP round up as well – love Gigantic Raft. Someone mentioned China Crisis reissues…are these happening? Excellent work Paul…..One of my most played LP’s together with the 12″ of ‘Ed’s Funky Diner’. Dear Paul, please include the Peel sessions. Excellent really looking forward to the release.I would also champion a pre-Life’s Hard Compilation including A Giant/Gigantic Raft/White Mans Hut.Any chance this would be a possibility? Fantastic, I can’t wait. That brings back memories. Wonderful news, subscribed! I’m wondering how everything they released around this album is going to fit on just 2 CDs. Still got all the 12″s and 7″ double packs as well the CD but definitely up for a deluxe edition as it’s one of my favourite albums of the 80s. +1 for a pre-Life’s Hard compilation, and a follow on deluxe for “Song” – great news though, it’s a mini-masterpiece, one of my most-played albums ever. Song has already been remastered with bonus tracks in 2009.
that means everything will be spot on. already have the original cd. been hoping for this. and I agree Ian, an early era compilation would be great. no need to be nervous haha … I know it’ll be great. is just not possible) – it’s just the fact what WILL be on will be great. No pressure Paul but ……:-) btw are you involved with the China Crisis reissues too? Err…. Hello, what China Crisis reissues????? Love China Crisis and the reissue of their Diary of a Hollow Horse album was superb! All kidding aside, when I preordered the New Gold Dream box I was hesitant bc of all the issues with other boxes. With Paul involved, I wouldn’t hesitate a second. I did end up (nervously) ordering the NGD box bc it was to good and cheap to pass up but we’ll see what that will bring. I believe it when I see it. A brilliant album and with you involved Paul I think everyone should be happy with whatever the track listing turns up. Can’t wait for this. Really looking forward to this, that’s great news. Do you know whether anyone ever looked at compiling their pre Life’s Hard material? Always liked the Warners stuff and Fish Waltz EP. Agree 100% Ian that material would be great to have cleaned up. including all the original 7″ versions. I hope this means we’ll get “Song” too and the so far unreleased “House For Sale” album. onwards and upwards. Yippee, an awesome album and look forward to getting all the 12″s in one place! Wow…. an amazing album! I am still a huge fan particularly of ‘Ed’s Funky Diner’ (I think I remember them performing this on ‘Wogan’) and the Shadows-like ‘Washing The Air’. And these guys knew how to ‘do’ an extended version…. both ‘Driving’ and ‘Ed’ were very different from the originals. Hurrah! Long overdue. Well done. A great, if overlooked, album Well done. For the record, Itsy were signed to Virgin affiliate Siren, not Circa.